Ryan and I are big fans of Canadian music. By that, I mean that a lot of the artists that we like happen to be from there, like Metric, Reverie Sound Revue, Feist, and Peaches, to name a few. We noticed that both Feist and Peaches often collaborate with an artist called Gonzales, so finally we decided to explore his other works. I was pleasantly surprised by who and what I found: a pianist. Jason Beck’s (aka Gonzales’) album Solo Piano, released in 2005, is a collection of short piano works, performed by Gonzales himself. The pieces are moody and minimalistic in nature, at times resembling the works of composers like Erik Satie. 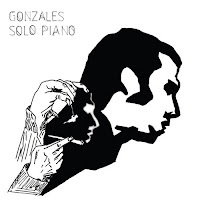 I encourage you to check out Gonzales’s piano music if you’re into Satie, or even film composers like Yann Tiersen. For the pianists out there, there’s a sheet music book as well. Gonzales performing “Gogol.” This piece was used in one of my favorite films, Paris je t’aime. I just can't seem to appreciate piano music. There are some songs that I love so much, but I can never bring myself to care about the playing. Piano playing just doesn't involve a lot of actions, unlike say, heavy metal guitar. "Gogol" is so simplistic and eerie, yet you can't stop listening to it! It's a song you'd hear on a rainy day in 19th century France or something. Yeah this is Satie all over, quite nice. In the end it don't matter how many notes there are, just the principles governing them - you can have harmonically complex pop songs that are relatively easy to bash out. Lot of people get too into rote technique, it becomes a means to an end rather than a hurdle. By the way, thanks for doing your piano vids - I'm still a beginner on the keys and theory in general and as you must know, watching other people play is a good way of picking up or noting certain things down. Your videos have been really helpful in that regard, so cheers for that! Just one last question - do you know / like Ryuichi Sakamoto or Yellow Magic Orchestra? It was mental for me to hear the first two YMO albums and realise that they were essentially video game music - in the late 70s!! Even weirder to find out so many of the big game composers were actually influenced by them. @Savin - "Speed" alone seems most impressive, but I don't believe it's the defining mark of a good musician. Many fast passages are easy to play - it just depends on the conditions surrounding it. What I like about Gonazales's performances are his attention to detail. He has a way breathing life into each note, especially the softer ones. It requires a different kind of mastery than shredding on a guitar does - BUT, I agree that action-packed performances are usually more visually interesting. @Nat - It does sound very influenced by romantic-era music. @GSK - I agree with that completely! Anyway, sounds like you're off to a good start. I'm also happy that someone could find my videos to be useful - imitating others is an efficient way to learn most anything. I have a feeling you'll enjoy this blog a lot. I didn't really like that movie. The music is very beautiful though. Thanks!